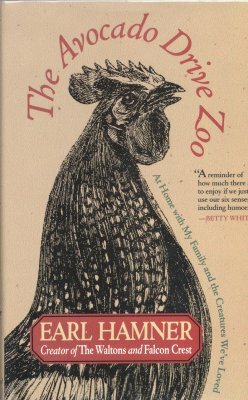 The book The Avocado Drive Zoo: At Home with My Family and the Creatures We've Loved is a "warm and personal, yet humorous, recounting of how Earl Hamner, his wife, Jane, and their two children have lived with and loved the animals in their lives." The book was published by Cumberland House, Nashville, Tennessee in 1997. Anson Collier Richard Kelton. The Foundling s1/e1. Ruth Collier Charlotte Stewart. The Foundling s1/e1. Holly Collier Erica Hunton. The Foundling s1/e1. 'Panhandle' Pete Harris Gino Conforti. The Carnival s1/e2. Performed as the Hobo Clown and player of the one-man band. 'Beautiful' Belle Brown Barbara Davis. The Carnival s1/e2. Tommy Trendel Billy Barty. The Carnival s1/e2. Marco the Magnificent John Harper. The Carnival s1/e2. Jake the Junkman James Nusser The Hunt s1/e4. Gino Michael Rupert The Boy From The C.C.C. s1/e8. Professor David Mann Noah Keen The Ceremony s1/e9. Paul Mann Radames Pera The Ceremony s1/e9. Miss Alvira Drummond Pippa Scott The Actress s1/e15. She has performed in the theatre and movies such as "Private Lives", "Crimson Lady", and "Romeo and Juliet"
She says she is now alone, probably implying that her husband Jimmy is deceased. Previously attended Sweet Briar College in Virginia. Now is attending Boatwright, and is in John-Boy's Chemistry class. Ran a red light, forcing John-Boy to hit the curb (and blowing out his tire). Later, she stole John-Boy's Chemistry notes. In high school yearbook, voted as "biggest hearbreaker girl"
Nicknamed in high school "Grover"
Works for Federal Trade Commission in Washington D.C. In high school yearbook, voted as "most original man"
In high school yearbook, voted as "prettiest girl"
Son of B.C. Graddy, Sr.
A con artist who teams with his granddaughter "Muffin"
Octavia says she is writing a book entitled "Octavia's Oven Adventures"